BMW has shown mock ups of what its design house, DesignWorksUSA, thinks Los Angeles police cars of the future should look and act like, and suffice it to say the results are mildly frightening, but ever so awesome. BMW calls it the ePatrol. Complete with three built-in drones, screens replacing windows, and 3D woven aluminum and carbon fiber seats, BMW must think that the municipality of Los Angeles will have a big budget for high-tech police cars in 2025. Based upon what DesignWorksUSA thinks LA of 2025 will look like with traffic heavy freeways and faster moving alternative drivetrain vehicles, the ePatrol is a small, highly maneuverable, modularly constructed vehicle. Look past its diminutive stature, levitation turbine, and touch-screen laden interior and its most striking feature is its built-in drones: one roof-mounted flying drone and two one-wheeled drones. In case of a traffic-laden pursuit, the officer inside the ePatrol can launch up to three drones to continue the pursuit: one flying drone that comes off the front of the vehicle and two one-wheeled drones that act as the front wheels. All drones send information back to the driver in the ePatrol vehicle and are also capable of sending a vehicle-disabling impulse to the vehicle they’re chasing. When the two one-wheeled drones are activated, the front of the ePatrol is supported by a levitation turbine that supposedly improves handling. The improved handling characteristics of the levitation turbine certainly begs the question: why not simply use levitation all the time? We presume it must be energy intensive. BMW’s press release was limited on detail for drivetrain technology but after studying the renderings, it appears the vehicle is powered — at least in part — by heat coming off the freeway concrete. 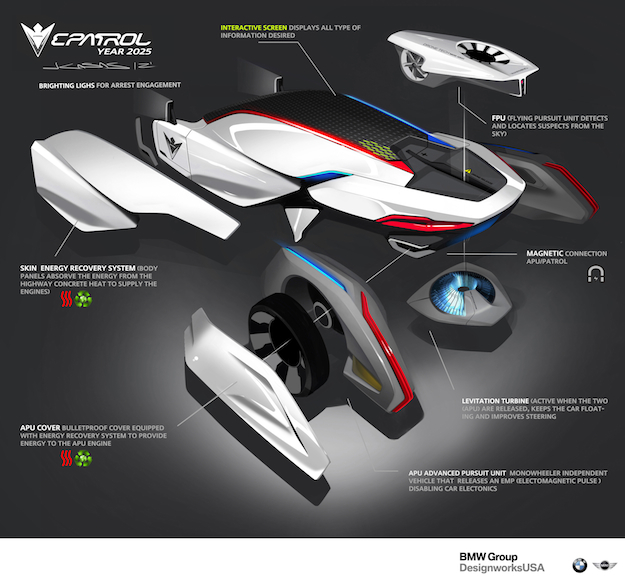 While we’re not sure this BMW DesignWorksUSA rendering is completely feasible in 13 years, it does remind us that the future will certainly be full of alternative drivetrains and drones. Lots and lots of drones.